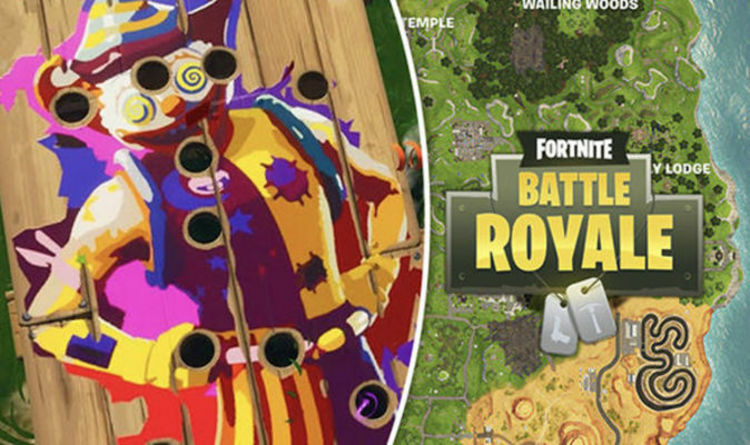 Home / غير مصنف / Fortnite Clown Boards: Where are the Carnival Challenge Week 9 locations? This week’s Fortnite challenges have provided a good layer of scavenger hunting to the usual blend of location-based tasks. As usual, players can earn XP and unlock rewards by completing weekly challenges, which can come in all sorts of shapes and sizes. And some tasks have proven more popular than others when it comes to completing them for the XP. This includes the Carnival Clown Board challenge, which appears to be the favourite task of Week 9. This may have something to do with it offering the most challenge of all the new tasks released this week by Epic Games. Visiting three different Clown Carnival Boards is a lot easier when you know exactly where to go on the map. The Fortnite island isn’t exactly a small place, so getting some help finding the three Carnival Clown Boards isn’t that big a cheat. When you have found the boards, players will also need to get a score of ten or more. Fortunately, you don't need to complete the challenge in a single game, so there's no need to rush. Carnival Clown Boards will be busy when the challenges go live, so you might want to avoid these areas for the time being (or get in some sneaky eliminations). The Clown Boards work like the Whack-a-Mole games you find at fairgrounds, meaning fans will need to activate the board and then use their harvesting tool to burst the balloons as they appear. Scoring ten on each of the three Clown Carnival Boards will help you complete the challenge. Fans should also receive a notification when this score has been reached, making it easier to finish. The map locations for these Clown Boards are somewhat clustered together in two different areas of the map. Two can be found in the North-West of the map, East of Junk Junction at C2 and the other at 4C at the bottom of Pleasant Park. Another two can be found Central-East of the map, found on I5, east of Lonely Lodge and the other at H7, Northwest of Paradise Palms. After completing all of these stages, the player should be rewarded with 5 battle stars. It should be noted that this is not a hard Battle Pass Challenge and is free for everyone to complete, regardless of if you have a battle pass.